So often (for us, anyway), as soon as we leave the house in our rain boots, the clouds seem to part, magically. And seriously, is there anything worse than being stuck in clunky wellies all day long while the sun shines down? 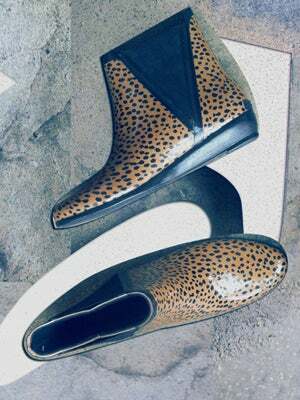 To address this weather conspiracy, Loeffler Randall, the leader in practical and pretty, weather-appropriate shoes, has truly outdone itself with the brand-new Rain Slip-On Bootie in Mini Lynx. Hey, we'd totally understand if you decide to wear these babies every day. Better safe than sorry, right? LR Rain Slip-Ons in Mini Lynx, $150, available at Loeffler Randall.